Data theft, spying, fabricated documents. The Spanish state is trying to derail Podemos and its challenge to elites. It’s been described as Spain’s equivalent of Watergate. With less than three weeks before Spain heads to the polls for a knife-edge general election, its political arena has been rocked by a series of revelations over spying operations directed at the left-wing party Podemos. On March 27 it was disclosed that the presiding judge in the trial of disgraced police commissioner José Manuel Villarejo had opened an investigation into the 2015 theft of the mobile phone of Podemos leader Pablo Iglesias’s assistant, Dina Bousselham, believing that it had been stolen by Interior Ministry officials. Private messages taken from the phone were later published by right-wing press outlets to whip up controversy over offhand comments the Podemos leader had made about a conservative TV presenter. This was only the beginning. The following day Villajero, who is on trial for running extortion and espionage operations against political targets, admitted to spying on Iglesias as part of a “criminal” investigation, moreover insinuating that former vice premier Soraya Sáenz de Santamaría (of the right-wing Partido Popular) had been aware of the operation. His testimony was then followed by the disclosure that high-ranking officials in the Interior Ministry had granted residency to a Venezuelan man in April 2016 in exchange for documents purporting to show the existence of offshore bank accounts belonging to Iglesias and other Podemos leaders. The payments in the accounts were meant to have come from the Cuban intelligence services and the Chávez government in Venezuela. Though never verified by the police, and later proven to be false, the information was leaked to the right-wing outlet OK Diario in May 2016 and then circulated throughout national media, at a time when Podemos and the Socialists (PSOE) were negotiating over a possible government coalition. The intent behind these moves was clear: to harness the Spanish state’s law enforcement agencies to smear Podemos and derail talks on creating a coalition of the Left as they reached a critical juncture. Those responsible came from figures in the highest echelons of Mariano Rajoy’s Partido Popular (PP) government, who sought to cling onto to power after inconclusive elections. A 2017 parliamentary inquiry found that “the investigation and persecution of political adversaries” took place with “the knowledge and consent” of the PP’s Interior Minister Jorge Fernández Díaz, citing as one example the fabrication of the so-called PISA report on illegal Podemos funding. Yet the scandal cannot simply be blamed on the PP. To frame this affair in liberal terms, as a straightforward abuse of state power by the governing party, is to ignore how actors from across the Spanish oligarchy came together in a coordinated attack aimed at neutralizing Podemos. As Iglesias has explained, this is a “criminal plot that links corrupt police to the media and major businessmen” and which “cannot operate” without the interaction of these various elements. Nor do these revelations leave current Prime Minister Pedro Sánchez (PSOE) untouched. In the latest twist, last Friday his deputy communications chief Alberto Pozos was forced to resign after it was revealed that as editor of Interviú magazine, he had handled the data stolen from the phone of Iglesias’s assistant. With Pozos now under investigation and some of the latest revelations taking place under Sánchez’s watch — such as the hacking of the security camera at the home of Iglesias and Podemos deputy leader Irene Montero — uncomfortable questions are been raised for the PSOE government. With the campaign heating up, Podemos is now aiming to shift the attention onto the premier’s own failure to confront shadowy forces at work within the Spanish state. In April 2016 a Spanish police chief inspector, José Angel Fuentes, traveled to New York to meet with former Venezuelan minister Rafael Isea. In the recording of the meeting, which was released last week, Fuentes asks the Chávez-era minister to provide dirty laundry on Podemos, telling Isea that “we don’t care if the document are good [i.e., real] or not” as Podemos won’t be able to disprove them. Fuentes belonged to the so-called Patriotic Brigade, a group of high-level police officers and Interior Ministry employees, including Villajero, who were tasked with damaging the political rivals of Mariano Rajoy’s PP government. Before Podemos was founded in 2014, the Brigade’s chief target were pro-independence parties in Catalonia. In the run up to the 2012 Catalan elections “a police report with no date or signature, and which nobody at the Interior Ministry has ever taken responsibility for” was leaked to the press. In it, former Catalan premier Jordi Pujol was alleged to have concealed millions in Swiss bank accounts. The case against Pujol is still ongoing, but in other cases the information was simply fabricated — as for example with the ex-mayor of Barcelona Xavier Trías. Again the timing was strategic, with El Mundo newspaper publishing claims, during the run-up to the first independence plebiscite in November 2014, that Trías possessed €12.9 million euro in Swiss accounts. This turned out to be completely false. The campaign against Podemos followed a similar pattern beginning shortly after the party’s foundation in 2014 and reaching its height after its historic breakthrough at the December 2015 elections. Some of the early attempts to smear the insurgent anti-austerity force were outlandish, even for the paranoid Spanish right, with the Patriotic Brigade seeking to link the party’s finances to drug cartels, Colombia’s FARC rebels, and even Hezbollah. Another crackpot theory found in one of the Brigades’ reports claimed Hugo Chávez was the real founder of the party, with “top Bolivarian experts” planning its organization down to the last detail. Yet in the crucial nine months in which Spain was without a permanent government between January and September 2016, Villajero and co. got serious. They leaked two internal police reports, as well as contents from the stolen mobile, in a bid to kill Podemos’s momentum and scuppering coalition negotiations with the PSOE. The first of these, known as the PISA report, came only weeks after the party first entered the Spanish parliament and claimed that Iglesias’s formation had received illegal funding from Venezuela and Iran, which supposedly included millions of euros “from the government in Tehran.” The second was the report on Iglesias’s supposed offshore bank accounts in the Caribbean, which was then followed in July by the scandal over Iglesias’s private text messages. The media impact these produced, and the weight attached to the fabricated leaks was only possible, however, with the collusion of the country’s press and television outlets. A key figure in this respect is right-wing journalist Eduardo Inda, who has operated as a sort of “middle-man” linking together Villajero and his Patriotic Brigade to major media outlets and business leaders. A close confidant of construction billionaire and Real Madrid Chairman Florentino Perez, Inda published exclusives on Podemos, such as the PISA report, on his news website OK Diario — relying on information received from Villajero. As a regular on many of Spain’s most popular news panel shows, he was then given a national platform in which to disseminate the smears further. If major news outlets could not easily publish such unverified police documents, which lacked official stamps and signatures, or data from a stolen phone, the frenzy manufactured around the OK Diario leaks could itself be reported on. Podemos was forced to spend several weeks fighting the accusations. TV stations’ and big newspapers’ willingness to play their part is not so surprising when we consider who owns them. Mediaset España, which includes two of Spain’s four commercial television networks as well as various cable channels, has as its controlling shareholder ex-Italian PM Silvio Berlusconi, with other investors including vulture fund Blackrock. The largest shareholder of Atresmedia, which owns the country’s other two commercial networks, is the Lara family, one of the country’s richest and, at the time, a major investor in Sabadell bank. Meanwhile Grupo Prisa, which includes Spain’s leading daily El País and the country’s major radio station Cadena Ser, is controlled by the likes of Amber Capital, HSBC, Santander Bank, and Telefonica. When we speak of political power or economic and media power, we normally speak as if they were independent of each other. And it is not like that. This is a triumvirate of power, with common interests, and when they want to crush someone — when their machinery is put into operation — the three work in unison … [In 2015–16] Pablo Iglesias was seen as a possible governing alternative. In some surveys, they were second, not far behind the Popular Party. [Podemos] had broken through in the European elections [in 2014] and the elites were terrified. Some thought they were going to confiscate their beach houses. They compared it to what was happening in Venezuela. And then I believe the decision was taken amongst the establishment — i.e., amongst this triumvirate of which I spoke before of political, media and economic power — to decide to avoid the coming to power of Podemos. There is no doubt all this has taken its toll on Iglesias, both politically and personally. In personal terms “it is not easy living beneath the hatred of the [dominant] class.” In the words of Manolo Monereo “those who have suffered it know its insufferable, systematic character that frays the nerves, destroys your privacy and fabricates scandal after scandal against you.” In political terms, the constant attacks have added to a certain disenchantment with Podemos, as well as progressive politics in Spain more generally, which has seen the party fall from its high of nearly 21 percent to its current polling position of around 13–14 percent. The Center for Sociological Research (CIS), Spain’s main polling body, has shown this week that 42 percent of Spaniards are still undecided on which party to vote for on April 28. At this point in the last campaign in 2016, this figure stood at only 32 percent. So, if Spain now faces the most uncertain general elections in living memory, how is this still-unfolding story likely to affect them? Iglesias then took aim at the Spanish media. Over the following weeks he doubled down on this argument in a number of public appearances, taking several presenters to task over media ownership and the corporate capture of Spain’s largest journalistic outlets. Iglesias’s comments inevitably provoked a backlash from many such outlets — notably one from liberal journalist Ana Pastor, whose husband, Antonio García Ferreras (also director of TV channel La Sexta), was confronted on air this week by Iglesias, as the Podemos leader accused his channel of being “one of the main protectors of Inda,” i.e., the middle-man between the “Patriotic Brigade” and media. Iglesias’s formation has sought to capitalize on the Villarejo revelations, incorporating them into its electoral strategy. It has especially sought to use the latest revelations to help shift the terms of the campaign debate. So far this has proven effective in pushing the media’s focus away from the national question and the ongoing Catalan trial — the terrain on which the Spanish right and the PSOE are seeking to contest these elections. It has instead directed debate towards questions of structural power and how it is maintained, putting the media on the back foot in the process. It is thus little surprise that the PSOE has proven one of the groups most silent on the latest Villarejo revelations, seeking to minimize the reach of a story it now seems impossible to simply bury. Not only does it benefit from a media framing of the election that avoids these questions of structural power, but its own record looks far from clean. Its connections to the Villarejo case in fact go further than just Sánchez’s Deputy Communications Chief, since last autumn his then-Justice Minister Dolores Delgado was also found to have been implicated in the broader conspiracy surrounding the former police chief. Just as Pablo Casado’s appeal as the new PP leader partly stems from the fact he represents a fresh-faced candidature, unsullied by the series of corruption scandals that have blighted his party in recent years, such links to one of Spain’s most serious political scandals in recent times risk tarnishing Sánchez’s relatively untainted image. It also risks undermining the overdue “clean-up” in public life that ostensibly formed the basis of his no-confidence motion last summer. Since it went forward, the Socialists have sought to prove that the party’s social agenda and the relative transparency Podemos has brought to Spanish politics in recent years could be carried out without their presence in government. Iglesias insisted, however, that Sánchez’s PSOE “is not capable of carrying out such a clean-up in the state” alone. He cited as a litmus test Podemos’s demands last year that the notorious Franco-era police torturer “Billy the Kid” be stripped of his medals and all other state-sanctioned honors or decorations he has received. 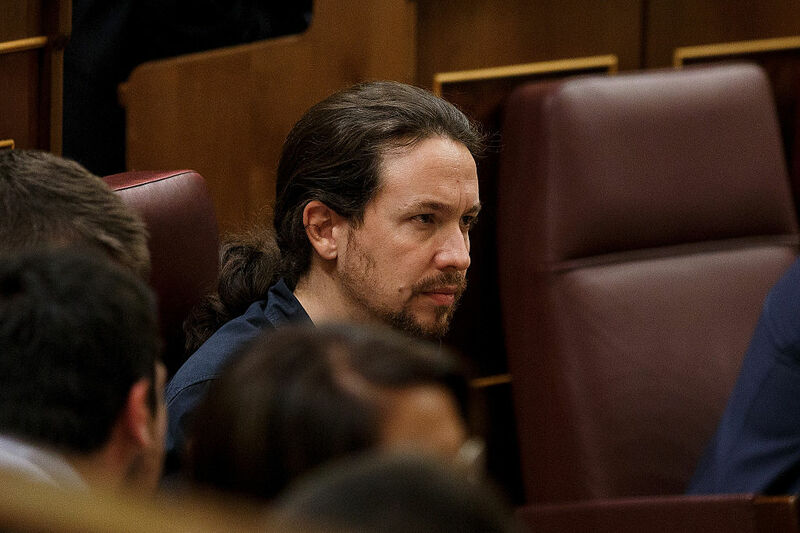 “[The PSOE] didn’t do it,” Iglesias observed. For this reason, he argued, it is fundamentally important that Podemos not only facilitates a government from the outside, as it did last June when it helped lift Sánchez into office, but that it helps form a left-wing coalition of the kind thwarted three years ago. Eoghan Gilmartin is a writer, translator and Jacobin contributor based in Madrid. He is also a member of Podemos. Tommy Greene is a freelance journalist and translator based in Madrid.